c.700BC First Iron Age hillforts constructed. 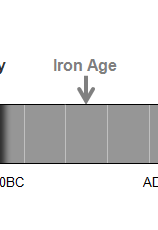 c.700BC Iron working technology becomes widespread. c.330BC First recorded exploration of the British Isles. c.200BC Decorative objects like jewellery start being made. c150BC Metal coins are used for the first time. c.150BC Iron Age settlements start appearing. Subpages (8): Celtic Lifestyles Celtic Tribes Celtic Warriors Clothes and Appearance Food Houses and Hillforts Religion and Beliefs When was the Iron Age?